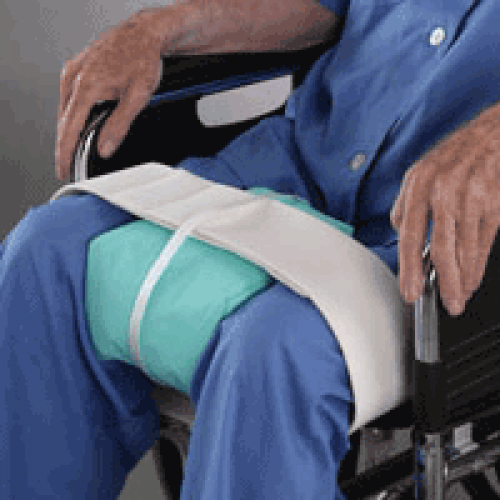 The Posey Knee Abduction Wedge aligns the thighs and trochanters of patients while they are in a seated position. The Abduction Wedge is recommended to prevent or treat skin breakdown caused by friction or pressure, and assist patients with abduction contractures. It includes a wide foam strap that comfortably secures the Positioning Device into place with a hook and loop fastener. Its polystyrene bead fill can be adjusted to varying patient needs by filling or emptying the wedge. A zipper closure allows access to the bead fill area, and bead fill kits are available for purchase separately when needed. Dimensions: 8 in. x 5 in., Tapers from 7 in. to 5 in.